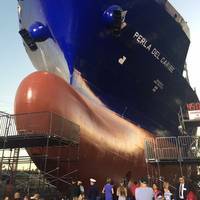 General Dynamics NASSCO hosted a christening ceremony for the first ECO tanker for American Petroleum Tankers (APT) under construction at the company's shipyard in San Diego. San Diego Mayor Kevin Faulconer spoke at the ceremony, and the ship’s sponsor, Mrs. Helen Downs, christened the ship with the traditional break of a champagne bottle alongside the ship. The ECO tanker, the Lone Star State, is the first of a five-tanker contract between NASSCO and APT, which calls for the design and construction of five 50,000 deadweight ton, LNG-conversion-ready product carriers with a 330,000 barrel cargo capacity. 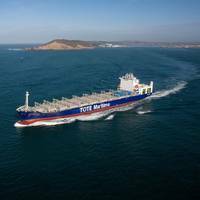 The 610-foot-long tankers are a new “ECO” design, offering improved fuel efficiency and the latest environmental protection features including a Ballast Water Treatment System. 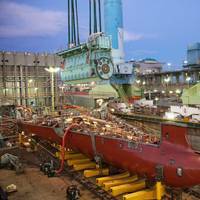 Late last month, NASSCO engineers placed the world’s first dual-fuel slow speed engine into the World’s First Liquefied Natural Gas (LNG) powered containership. The ME-GI engine represents the next generation of technology that will open the door to a cleaner and safer shipping industry, particularly in the United States. Doosan Engine built the 8L70ME-C8.2GI under license from the designer MAN Diesel and Turbo. The engine weighs 539 tons. 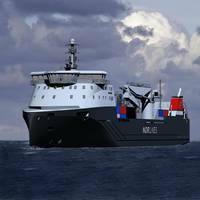 TOTE Shipholdings, Inc., a subsidiary of TOTE, is the first company to use these engines in their vessels. 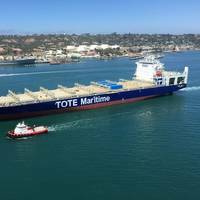 The arrival of the world’s first dual-fuel slow-speed engine to General Dynamics’ NASSCO Shipyard marks the next phase of construction for TOTE’s Marlin Class vessels, projected by TOTE to be the world’s safest and cleanest containerships. 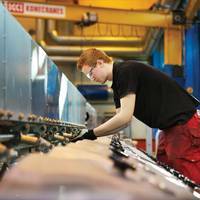 Doosan Engine, under license from MAN Diesel and Turbo, delivered the first 8L70ME-GI engine. Earlier this year, Doosan completed the engine’s Factory Acceptance Tests, a culmination of months of testing to ensure compliance with U.S. regulations and restrictions. 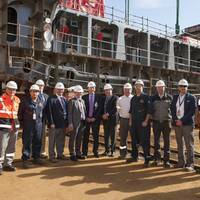 Matson Signs Contract With Aker Philadelphia Shipyard For Two New "Aloha Class" Containerships, First Ship To Be Named The Daniel K. Inouye. 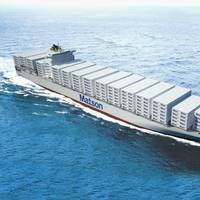 Matson, Inc., a U.S. carrier in the Pacific, announced today that its subsidiary, Matson Navigation Company, Inc., has signed a contract with Aker Philadelphia Shipyard Inc. (APSI) to build two new 3,600 TEU containerships for an aggregate price of $418 million. 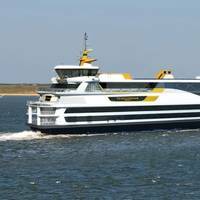 The new vessels will be equipped with dual fuel engines that have liquefied natural gas (LNG) capability and are expected to be delivered in the third and fourth quarters of 2018. 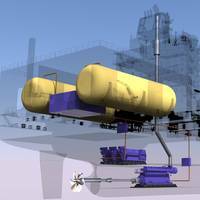 The Korean Register, an IACS member classification society, is leading a project to build and operate the world’s first green-ship equipment certification center in Gunsan, Jeonbuk, Korea which is due to open in February 2014. Work is already underway and the new $269 million won facility is being constructed with the full support of the Korean Ministry of Maritime Affairs and Fisheries, the local government and various research institutes. The project has been created in response to IMO’s greenhouse gas emissions reduction and maritime pollution regulations and will enable KR to lead the way in certifying essential green-ship components, including engines. The American Society of Mechanical Engineers (ASME), in coordination with the United States Coast Guard (USCG), is sponsoring a two-day public workshop on marine technology and standards on July 29 and 30, 2010, in . The USCG/ASME Workshop on Marine Technology and Standards scheduled for July 29 and 30, 2010, in Washington DC, is a unique opportunity for classification societies, industry groups, standards development organizations, government organizations, and other interested members of the public to come together for a professional exchange of information on topics ranging from the technological impact on the marine industry, corresponding coverage in related codes and standards, and government regulations. 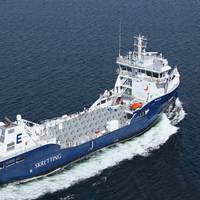 March 2013 saw Rolls Royce collect the Green Ship Technology Award at the Green Ship Technology Conference in Hamburg for its Environship concept, which has lean burn Bergen Engines gas power units at it core. 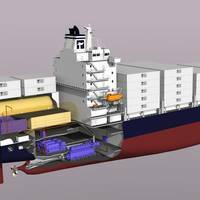 The Environship combines a range of Rolls Royce technologies (Bergen Engines is a subsidiary business) in a cargo ship model that, set against comparable vessels using diesel power engines, offers CO2 reductions of up to 40% (alongside 92% reductions in NOx and 100% less SOx emissions). 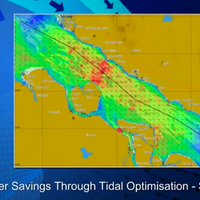 The 6th Annual Green Ship Technology (GST) conference will provide insight into the progress of measuring, managing and mitigating shipping’s contribution to climate change. Coming shortly after the intercessional meeting of the IMO’s greenhouse gas working group and ahead of the 59th session of its Marine Environment Protection Committee in July, GST 2009 will hear the views of regulators in discussion and debate with industry organizations and shipping experts. IMO Marine Environment Division director Miguel Palomares and the European Commission’s Mark Major are among those set to take part in this two day conference. 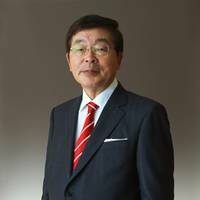 Proceedings will be guided by chairman of the IMO MEPC, Andreas Chrysostomou. 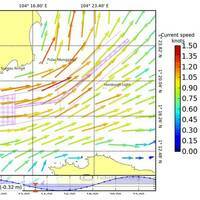 The conference takes place this year in Hamburg on March 24-25. 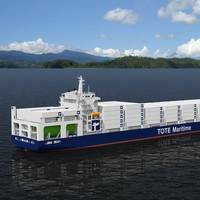 Historic deal in U.S. General Dynamics NASSCO finalized a contract with TOTE, Inc., for the design and construction of two 3,100 TEU LNG-powered containerships, setting a new benchmark in green ship technology. When completed the 764-ft.-long containerships are expected to be the largest ships of any type in the world primarily powered by liquefied natural gas (LNG). 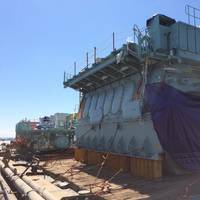 Construction of the first containership is scheduled to begin in the first quarter of 2014, with delivery to occur by the fourth quarter of 2015; the second ship will be delivered in the first quarter of 2016.